The subject of graffiti often brings out strongly polarized reactions from urban dwellers, who either support it as art or criticize it as vandalism. 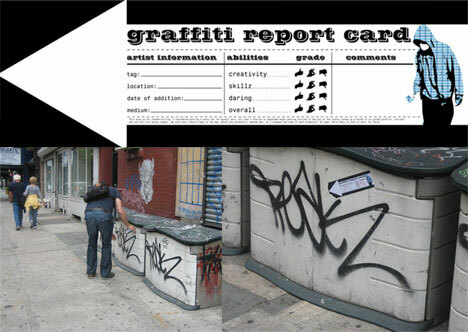 Brandon Baunach of DesignCrack has developed a project based on an idea of Drew Heffron that has amazingly drawn both fire and criticism from both sides: Graffiti Report Card stickers for rating urban street graffiti. Some taggers have expressed annoyance at the notion of having their work judged while other graffiti critics see this project as just another layer of vandalism. Still, the project has merits and raises interesting questions both parties seem to overlook. First, there is an element of playful humor that graffiti artists should appreciate, a meta-commentary worthy of political graffiti artists like Banksy. Second, if a graffiti artist can claim the right to decorate a public surface one way, how can they expect to deny the public the right to add to their public composition? Finally, street graffiti is a fact of urban life and many of us would like to see it more frequently discussed one way or another. By way of comparison: consider the video above. How is it that some people can tolerate thousands of flashy, obnoxious and jarring commercials that bombard us on a daily basis and yet are disturbed by graffiti? 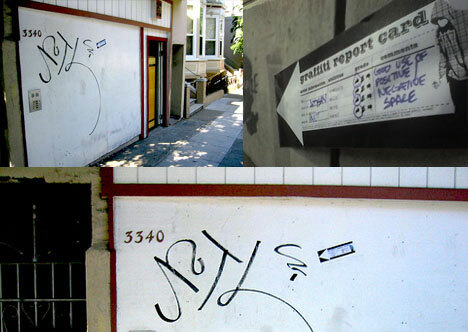 Taken together, a graffiti report card or a subvertising project like the one shown above are, if nothing else, valuable reminders to always be critical of the visual character of the build environment we live in.